Touching, no? Well it is a fairly historically important movie so while the kids are introduced to the classic you can still get a bit out of the background and production of this little masterpiece. The extras that come on both Disc 1 and the bonus Disc 2 are full of this background information and to someone on whom Pinocchio’s magic doesn’t quite have the same effect it used to, this stuff was the best part. As well as the voice over commentary by film critic Leonard Maltin, historic animation / director Eric Goldberg, and biographer J.B. Kaufman you get a fascinating documentary called “No strings attached: The making of Pinocchio”. This pulled footage from the 30s, 80s, 90s, and present to interview and showcase significant people involved in the Pinocchio project. It really will give you a new sense of appreciation for the movie – for example did you know it was only the second full-length animated film by Disney? 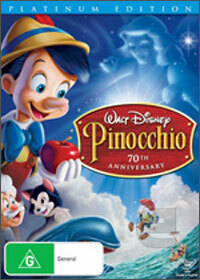 This is after Snow White which was the first full-length animated film ever and its stunning success funded Pinocchio. It was all pretty groundbreaking stuff and to hear the guys in the documentary tell it you’d swear it was the greatest cinematic masterpiece to ever grace the silver screen. I could go into more detail about the documentary because I really did enjoy it, but I don’t want to spoil it for you. In addition to the commentary and documentary you get a 2009 rendition of “When You Wish Upon a Star” (quite the hit in the 1940s, dontchaknow? ), the ability to “song select” so you can sing along with the movie’s songs (kids will probably love that one), and pop up “fun facts” to notate the movie as it plays. On disc 2 there are a couple of short “behind the scenes” documentaries to accompany the longer “No strings attached: The making of Pinocchio” as well as a deleted scene, deleted song, and a collection of trailers. They seem to have made a nice collector’s edition for the ol’ Pinoc on his 70th birthday. The disc case itself is even a bit special. It’s a thin card/booklet/case. It’s a bit hard to describe, but instead of a modern DVD case it is a fancy booklet with hard cardboard covers and the discs are squirreled away at the back. The book pages have some mildly interesting information in it, but the whole package looks pretty nice. I’m not sure how robust it will be compared to a normal DVD case, but it is nice and thin – great for storage. This edition seems to be a bit of a collector’s item – I’m not entirely sure who out there is that big of a fan of Pinocchio but I can imagine a grandparent who has always loved the movie wanting to share that with the kids. If your kids have never seen the movie, now would be a good time to get it – but it’s a bit hard to suggest a nice collectable item like this for the childlings – I know what they’re like, and careful is generally not a word that springs to mind. If I was getting Pinocchio for the kids I would probably opt for the standard DVD that still has the story they’ll no doubt enjoy, but without the bells and whistles that this edition brings. If I had really liked the movie as a kid or was a bit of an animation buff – this edition seems to be pretty well packaged.